Due to inclement weather, Duncan McCue will not be able to join us in person for his Keynote address. He will instead join us for a Skype lecture, live in Alumni Hall, at 7 p.m.
Every year, Armbrae Academy brings local high school students to King’s for two days to examine and discuss a particular topic. This year’s keynote address will be delivered by Duncan McCue, BA’92, DCL’18, host of CBC’s Cross Country Checkup and author of The Shoe Boy: A Trapline Memoir. A question and answer session will follow. 1:15 p.m.: Truth Pursued: The Journalist’s Mandate: We will view Anatomy of A Killing. This documentary will show the remarkable lengths a team of BBC investigative journalists went to to uncover the facts of the murders of Cameroonian civilians by members of the Cameroonian Armed Forces. 1:30-2:15 p.m.: Skype interview and Q&A with BBC investigative journalist, Aliaume Leroy, a member of the team that pursued the truth (the facts) as shown in Anatomy of a Killing. He will tell us about the techniques of investigative journalism and the personal, emotional investment related to this type of reporting. This event is open to the university community and the general public. 2:30-3:30 p.m.: Acclaimed radio and television journalist, author and professor here at King’s, Pauline Dakin will address the notion of Truth Contrived. Pauline’s contribution, followed by a Question and Answer session, will feature the incredible story of her early life as told in her recent book, Run, Hide Repeat, “a memoir of a childhood steeped in unexplained fear and menace.” This event is open to the university community and the general public. 3:45-4:30 p.m.: Truth as Seen: The Eye Witness Account: All of you will become judge and jury as you watch events unfold in the NFB film, The Purse. Following group discussions you will deliver your verdicts based on what was seen and heard. 7-8:30 p.m.: Keynote address: Truth as Perception: Memory, Memoir and Heart Knowledge. 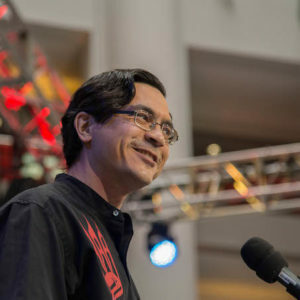 Journalist and author Duncan McCue will discuss truth as perception, using his coming-of-age memoir The Shoe Boy as a leaping off point to consider Anishinaabe teachings of debwewin (loosely translated as “truth,” literally translated as “sound of the heart”). This event is open to the university community and the general public. 8:30-9:30 a.m.: The Huddle: Meeting alone with Duncan McCue in Alumni Hall, you will have the opportunity to engage in an intimate, open and frank discussion about the substance of the previous evening’s keynote address. Duncan will also entertain your questions about the nature of truth. 9:45-11:15 a.m.: Truth Examined: Humans engage in conversations and discussions in which they offer their reactions to/assessments of an event, situation, development etc.. It can happen to all of us a number of times during a regular day. In the media we see professionals do the same thing. Columnists and cartoonists who “typically combine artistic skill, hyperbole and satire in order to question authority and draw attention to . . . . .”, are professional commentators. Cartoonist, Mike de Adder, who drew for his high school newspaper, and Jim Vibert, writer, are a local professionals who comment on affairs of the day, using their own style and medium. Addressing Truth Examined, they will help us to understand the relationship between truth and public commentary. 12:45-3 p.m.: Dialogues: Dialogue’s program input is finished and now it is your turn to engage one another on the theme of the symposium: What is the nature of Truth? Prior to the actual days of Dialogue you will receive guiding questions that we hope will be a catalyst and support for discussion.